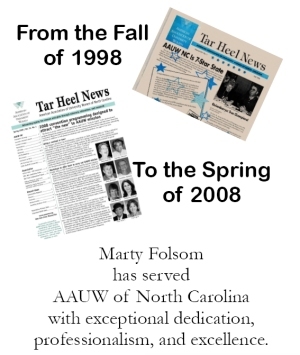 Marty Folsom has been a part of AAUW NC meetings since 1998. She has been much more than the newsletter editor, she’s been a key member of the board. Those who attended the convention were given a chance to write their own comments of thanks to Marty. The comments were collected in a booklet and presented to her along with a framed copy of this poster. If you didn’t get a chance to participate in Greensboro, feel free to add a comment! Whereas you edited out our mistakes and polished our writing until it looked professional, we say “thank you”! You have done a marvelous job of disseminating information to all members of AAUW NC. We will miss all your contributions to AAUW NC. Thank you from us all. Marty has done a terrific job over these 10 years. Many, many thanks, Marty, for all you have done. You will be very hard to replace. What a great job you have done! Thank you, Marty, for your ten years of dedication to the Tar Heel News and the general AAUW NC membership. We will miss your considerable talent. Marty: Thank you for ten years of wonderful service on the Tar Heel newsletter. It is always well written and interesting and makes me feel connected to a larger community of AAUW members. You were dearly missed this weekend. You have done a marvelous job over these past 10+ years. I cannot imagine you not being editor. Thanks so much for your hard work for such a long time. Your creativity is remarkable. Enjoy your “free” time now! Thank you, Marty, for your 10 years of service to AAUW NC. This organization needed your talents to put the new out there for our members and prospective members. Your phenomenal expertise will be greatly missed – as will your viewpoint! The time and energy you so graciously gave to AAUW NC cannot be adequately thanked and expressed in mere words. We will miss you! And I thank you!!!!! You heightened our awareness of disabilities and changed forever our perspective on conducting meetings with equal access to all. Thank you for all of the work that you have done with the THN. It was always a pleasure to submit articles to you because I knew they would be included. You have helped to keep us informed! Winston-SalemThank you, Marty, for all of your service to AAUW. I enjoyed meeting and working with you during my term as Salisbury branch president. I wish you much happiness and fulfillment in all of the things you choose to do in the future. Marty was wonderful and we’re going to miss her! Your work as newsletter editor is the living legacy of AAUW North Carolina for a decade. Thank you for all your hard work, your adherence to deadlines and making us all look good. Thank you for all your time and energy in completing the newsletter for 10 years. You will be hard to replace. Thank you for all you do! God bless Marty and her extraordinary talent. Her patience and guidance made my time as program vp so much easier. We will miss Marty’s professionalism and her ability to make a difficult job seem easy. Whereas Marty has dedicated many hour of her time and expertise to produce the AAUW NC Tar Heel News, the state convention, in unanimous acclamations, thanks her for her professional and gracious service. What a great job you have done with the newsletter – it will be hard to fill your shoes! My very best wishes for a healthy and happy “retirement.” I am sure you will be missed immensely following your ten years of service with the Newsletter. Your contributions as an editor, graphic designer, and publication specialist have made an enormous difference in how AAUW NC presents itself to the world and its members. Your contributions as a thoughtful and creative board member, always holding the mission in mind, will be sorely missed.